You may not know what epigastric pain is, but there is a good chance that you know how it feels. Epigastric pain is pain that occurs in the upper abdomen, which is the area just beneath your ribs. It’s common for people to experience epigastric pain while they are eating or directly after eating. It can range in severity from mild discomfort to an extremely painful burning sensation. Epigastric pain can come with many other digestive symptoms, including constipation, diarrhea, and bloating. So if epigastric pain is so common, what’s causing it? 1. Acid reflux: Acid reflux and gastroesophageal reflux disease (GERD) cause stomach acid to flow upwards into your esophagus (which is the tube that connects your stomach and throat). This causes epigastric pain, particularly when laying down after eating a meal. While anyone can experience occasional acid reflux, GERD is a chronic disease that requires treatment. 2. Gastritis: Gastritis refers to inflammation of the lining of the stomach. This can be temporary, often due to infections or other triggers, or it can be a chronic condition. 3. 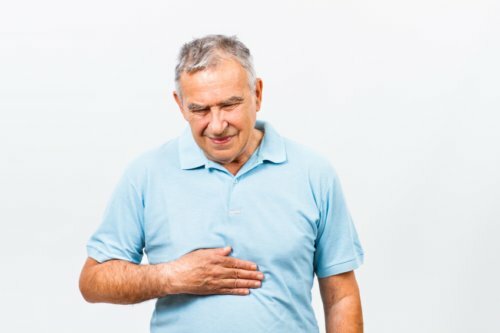 Heartburn and indigestion: Similar to acid reflux, indigestion occurs when your stomach produces an excessive amount of acid that flows up into your esophagus. This commonly causes heartburn, which is a burning sensation in your chest. However, it also typically causes epigastric pain. Indigestion can be either temporary or a repeated occurrence. 4. Pregnancy: Pregnancy can bring a wide range of health issues with it, and one of those is epigastric pain. Pregnant women have more pressure on their abdominal walls, which can cause pain. Hormone fluctuations can lead to issues with digestion that cause acid reflux and other conditions associated with epigastric pain. 5. Alcohol consumption: While most people know the harmful effects of alcohol, few realize that drinking alcohol is also a cause of epigastric pain. Alcohol can irritate or damage the lining of your stomach, which can result in inflammation. 6. Overeating: Eating too much can lead to epigastric pain. Like with pregnancy, although to a lesser extent, excessive eating can put pressure on your abdominal wall. It can also lead to indigestion. It is common for people to experience pain after eating too much. Luckily, overeating can easily be corrected. 7. Lactose intolerance: Lactose intolerance is a condition where your body cannot properly digest lactose, which is found in dairy products. One of the most common symptoms of lactose intolerance is epigastric pain. As well, other food allergies or sensitivities could potentially trigger epigastric pain if you have trouble digesting them properly. 8. Stomach cancer: While many causes of epigastric pain are innocuous, it can also be a sign of a serious condition like stomach cancer, as well as pancreatic cancer. One of the first signs of cancer is the sudden onset of unexplained pain. 9. Gall bladder infections and gallstones: Any condition that affects your gallbladder can also cause epigastric pain. Typically these types of conditions cause pain on your lower right side, but that pain can spread up to your upper abdomen. 10. Peptic ulcer disease: One of the most common causes of epigastric pain is peptic ulcer disease (PUD). In this condition, an ulcer or sore forms in your stomach or small intestine. While these are 10 of the most frequent causes of epigastric pain, there are many more potential conditions that can lead to this type of pain. Hernias, bacterial infections, diseases (including cardiac disease), and side effects of medications can all play a part in epigastric pain. With all the potential causes of epigastric pain, how are you supposed to determine which one is contributing to your pain? The only way to accurately determine what is the cause of your specific pain is to see a doctor or a medical professional who can conduct a thorough medical examination and order tests. With so many potential causes, it is vital to see a doctor. While your pain could be due to something as simple as overeating, it could also be the first signs of stomach cancer. Your physician may have to conduct tests to determine what’s causing your pain. This could include a blood test, urinalysis test, or a test to identify inflammation in your body. Epigastric pain does not only hurt, but it can also bring about a range of other symptoms with it. Depending on what’s causing your pain, you could experience many other digestive symptoms too, such as bloating, gas, constipation, diarrhea, and nausea. If this is a one-time occurrence, it may simply resolve on its own, but repeated occurrences need medical treatment. More extreme symptoms can include weight loss and vomiting. When this occurs, they could be signs of more serious conditions that should be evaluated by a physician. One thing to keep in mind is that epigastric pain is not always limited to your upper abdomen. The pain can radiate up to your chest, neck and back. If you’re experiencing excessive pain throughout your entire upper body, it could be due to something like gastritis or acid reflux. However, only a doctor would be able to diagnosis the cause. Treatment of epigastric pain depends entirely on what is causing it. For pain that occurs because of overeating, alcohol consumption, or food triggers, nothing more than lifestyle changes are typically necessary. By stopping the behavior that causes the pain, your pain will resolve itself. For serious conditions, such as diseases or cancers, the underlying cause has to be treated. Currently, there are some medications that can reduce epigastric pain. Anti-inflammatory medications can help calm inflammation, while antacids and other treatments can reduce the amount of stomach acid you are producing. However, many natural treatment options are also effective. There are a wide range of natural remedies that can soothe your stomach and improve your digestion. Cumin seeds, fennel seeds, and lemon juice all help secrete digestive juices in your stomach. Having a warm glass of lemon juice and a couple of tablespoons of cumin seeds before a meal will help prevent any pain from developing. After a meal, eat half a teaspoon of fennel seeds, unless you’re pregnant. Epigastric pain is an uncomfortable but common condition for many people. There are a large number of health conditions that can contribute to it. While many of the causes are not concerning, it is still best to see a doctor to rule out serious disorders. Most of the time, you don’t have to worry and your pain will resolve on its own. However, even if epigastric pain is not caused by something serious, it’s still best to get it treated. Your quality of life can greatly improve without having to deal with pain whenever you eat a meal. “Epigastric Pain: What Can Cause Pain in Epigastric Region,” ePainAssist web site, http://www.epainassist.com/abdominal-pain/epigastric-pain, last accessed November 30, 2015. “Epigastric Pain Causes,” Healthgrades web site, http://www.healthgrades.com/right-care/digestive-health/epigastric-pain–causes, last accessed November 30, 2015. “Epigastric Pain (Uncertain Cause),” University of Minnesota Medical Center web site, http://www.uofmmedicalcenter.org/healthlibrary/Article/116731EN, last accessed November 30, 2015. “Everything You Need to Know About the Epigastric Pain And Treatment Methods,” TreatEpigastricPain.com, http://treatepigastricpain.com/, last accessed November 30, 2015.